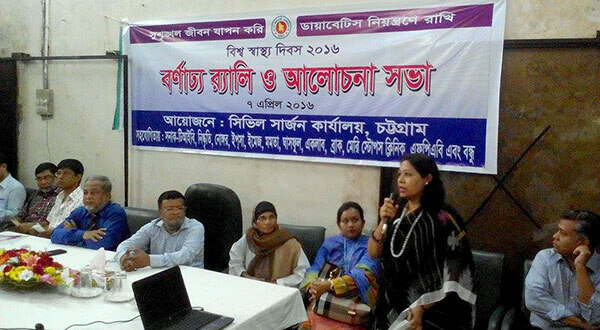 YPSA observed World Health Day’16 jointly with District Civil Surgeon Office and different NGOs of Chittagong on April 7, 2016. The theme of the day was “Make healthy choices everyday: Keep diabetes at day”. Colourful rally and discussion meeting were arranged on the occasion of the day. Mr. Mesbah Uddin, Deputy Commissioner of Chittagong district has inaugurated the rally from in front of Chittagong Press club. After the rally, a discussion meeting was held in the Civil Surgeon Office. Dr. Alauddin Majumder, Director of Health Department was the chief guest of the meeting and the meeting was presided over by Dr. Azizur Rahman Siddiqu, Civil Surgeon of Chittagong. The keynote paper on the significant and theme of World Health Day’16 was presented by Dr. Abdullah Abu Sayed, Consultant (Medicine), Chittagong General Hospital. Dr. Ajoy Kumar Dey, Deputy Civil Surgeon delivered the welcome speech. Doctors, Nurse, Media, Students, NGOs and civil society has participated in the program. Ms. Nasim Banu Shyamali has delivered her speech on behalf of YPSA. Ms. Farhana Akter, YPSA has moderated the sharing meeting.